In 2009, one fatality involved dogs from two different breeds, thus producing a death count total of 33, rather than 32. Eight dog breeds each contributed to one death: American bulldog, blue heeler-mix, chow-mix, great dane, Italian mastiff, malamute, collie-mix and weimaraner. In 2009, the combination of pit bulls (14) and rottweilers (4) accounted for 56% of the attacks resulting in human death. This same combination accounted for 72% (107) of the total recorded deaths (149) during the 5-year period of 2005 to 2009. The breakdown between these two breeds is substantial over this 5-year period. From 2005 to 2009, pit bulls killed 85 Americans, about one citizen every 21 days, versus rottweilers, which killed 22 Americans, about one citizen every 83 days. 2009 data shows that 63% (20) of the attacks involved children 11-years and younger and 38% involved adults, 21-years and older. Of the child victims, 60% (12) were ages 2 and younger. Of all attacks, males were more often victims, 59%. In 2009, 38% (12) of all dog bite fatality victims were either visiting or living temporarily with the dog's owner when the fatal attack occurred, up from 17% in 2008. Children 10-years and younger accounted for 83% (10) of these deaths. Annual data also shows that 38% (12) of all fatal dog attacks involved more than one dog; 13% (4) involved a pack attack of 4 or more dogs. 25% (8) occurred off the owner's property and 19% (6) of all dog bite fatalities involved chained dogs. 13% (4) of all deaths resulted in criminal charges; 75% (3) of these cases involved pit bulls. Texas filed criminal charges in 2 dog bite fatality deaths in 2009. Both cases involved felony injury to a child; in one case, the defendant died before the trial. The state of Texas had the most dog bite-related fatalities (5). 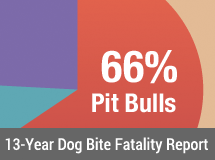 The combination of pit bulls and rottweilers (4) contributed to 80% of these deaths. Georgia and Illinois followed, each with 4 deaths, and California and Virginia each incurred 3 deaths. Change Log: In July 2015, the 2009 Dog Bite Fatality Statistics were reissued with the following changes: The 5-year combined total deaths of pit bull and rottweilers (from 2005 to 2009) increased by 2% due to reclassifications and additions in earlier years. On October 13, it was reported that Timothy Niemeyer's "brain function has ceased" and he was surviving only with a respirator.